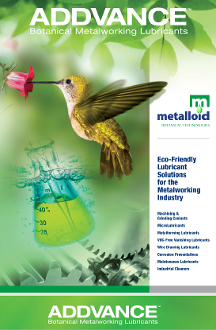 Metalloid Addvance 6030C Plant Based Metallworking Fluid. With no petroleum, sulfer, or chlorine you won't have to worry about dermatitis with this product. The super biocide package prevents foul odors and this clean running coolant won't stain Aluminum, brass or bronze.